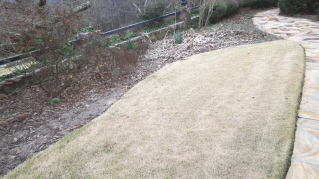 Preparing the garden for an early spring event. 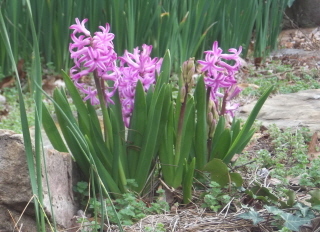 part one of a series – Johntheplantman's stories, musings, and gardening. March 1, 2012: The phone rang right after lunch. 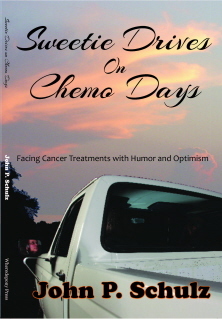 “John,” Patsy said, “Don’t forget about the Junior Service League tour of gardens in April.” I replied that I had not forgotten and that we were on the same page. I have been working on the yard on the mountain for probably thirty years and it is one of my favorite places to visit and work. 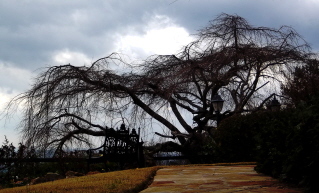 I pictured the grand weeping cherry tree silhouetted against the late winter sky. The tour of gardens is scheduled here in Rome, Georgia for April 28, which is early enough in the North Georgia season to warrant some creative thinking. I realized that I had two months to put on a show. It was time to start. A wise old gardener had once told me, “Son, in your business, timing is everything.” I listened. 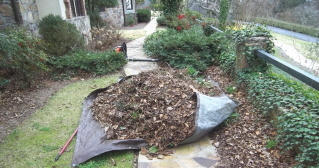 March 2: We loaded cutters, blowers, rakes, tarps, and other useful implements into the truck and headed out. 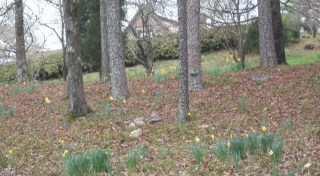 The driveway is a bit over a half a mile long and as I reached the final curve heading for the house, I grinned at the daffodils that I remembered planting in my much younger days. 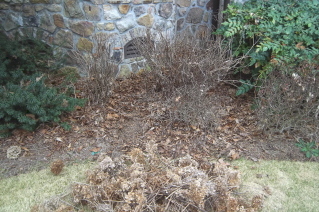 I figured that the first thing was to clean out all of the winter debris from the flower and shrub beds. 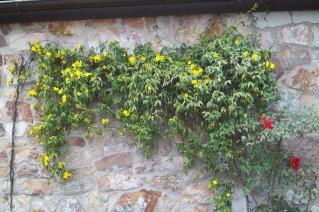 I had pruned the knockout roses in December, but I wasn’t happy with the way the ivy had crept in. Late winter is a wonderful time to take care of such as this. 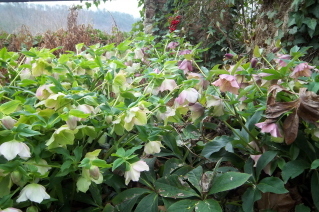 On down the walkway I found some beautiful Lenten roses showing off under a tree. The grouping is backed up with perennial ferns which had browned out through the winter. We would trim the dead fronds and hope that the ferns reappear before the event. I decided that it was time for me to deadhead the Annabelle hydrangeas and shape them a bit so that they will bloom in a tiered pattern. I doubt that they will be in bloom for the event, but the foliage will be lovely and, one never knows. We started to work. 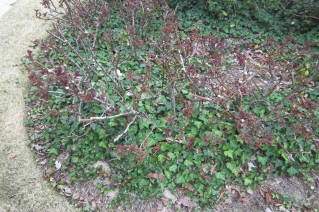 The ivy is removed from the knockout roses and I am pondering as to whether or not they need a bit more work. I’ll bet we can count on some blooms here.I’ll feed them next week. The bed looks much better. Ivy gone from under the roses. I’ll have to remember to stay on top of it. 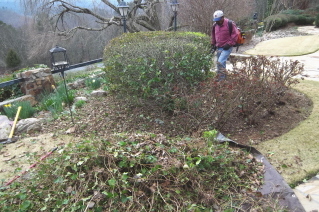 I have pruned the hydrangeas so that they will make a mound leaning back toward the house. They don’t look like much now, but they will be beautiful in just a few weeks. 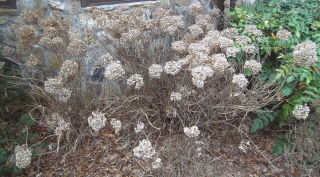 Hydrangeas after deadheading. They look like a bunch of sticks, but just wait. We continued deep cleaning the beds. I like this job because it gives such an immediate feeling of satisfaction when viewing the finished project. Almost to the end of the upper front walk, we stop for a late lunch break. 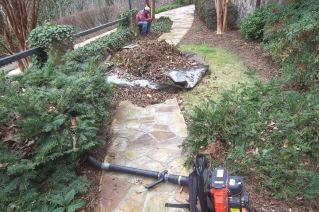 The cleaning and pruning is going well and we finish by the end of the day. My notebook is full of ideas on how I will have flowers in bloom and accent plantings ready for the tour. Remember, timing is everything. I hope to see a picture of the Annabelle hydrangeas in full bloom and no doubt those Knockout Rises will pack a mean punch too. I meant “Roses” of course!